20.6 degrees and a little bit icy to begin with, especially with the cool wind blowing, but I was loving every lap of my first swim of the season in The Icebergs today. Just simply glorious! Felt so damn good in there and even better afterwards. Am inspired to try and get in there as much as I can over the next few weeks. Still, very unseasonal weather for 3 days before Xmas. To think that at midday with the sun shining, there were only about half a dozen people in the pool. Bondi was surprisingly quiet for the middle of the day during Festive Season time. I was amazed at how many parking spots I saw available. But when I headed into the Junction later in the arvo for a nice hit of happy gas (in the dentist’s chair), I realised why Bondi Beach was so quiet. Yes it really was Bondi Jungle in there today, everybody racing around, doing their Xmas shopping. Only 3 more days till Xmas Day and we’ll see if the beach hosts the usual massive Xmas party…and if the weather behaves! Waverley Council clean up trucks on stand by…. 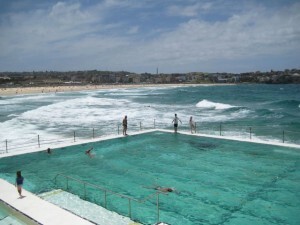 Hi, I love floating in the big blue ocean of bondi, enjoyed the photos on your blog!